KDE was one of the first desktop environment I used when I started using Linux Back In 1998 , KDE was just out of beta and KDE Team had released 1.0 version of the Desktop Environment. At that time KDE was a revolution on the Unix platform, other desktop environment like CDE etc though were extremely good as desktop manager, but were not user friendly and there was non-existent interaction between different applications running atop these Window Manager.The applications running atop these Window Managers felt alike and disconnected from each other. Over the past decade I have been a distro-junkie, jumping from one distribution to other and from one desktop environment to other.However ,over the past couple of years I have spent most of my time on Gnome (another popular desktop environment that was born because of licensing issues about QT, a framework KDE uses internally) because it was much faster compared to KDE and there was nothing radically different in KDE that gnome did not offer.However, KDE 4.1 might soon change all that. 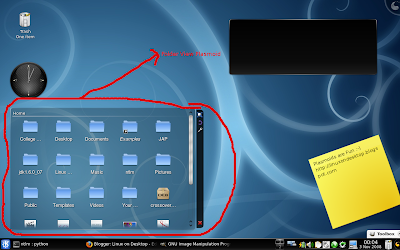 KDE 4.x includes the Plasma desktop Shell, that extends the capabilities of the conventional desktop by allowing you to interact with Visual elements like Panels, Icons , Widgets to a level that you might have never done on other Desktop environment/Operating Systems e.g : If you want you can rotate the Plasmoids , or maybe change the orientation ,length or height of the panel at the bottom. 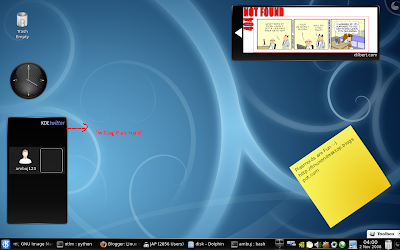 Plasma desktop allows you to put Widgets (aka "Plasmoids") on desktop. Plasmoids are small applications that perform a number of different tasks (like Displaying Comic Strips , or essential things like Displaying Trash Icon , Displaying Icons on your desktop etc ), Also it is extremely easy to install new Plasmoids . Support for Mac OS X Dashboard applets is underdevelopment and it should be included in future releases. One of the most useful "Plasmoid" is the "Folder View" Plasmoid that allows you to view content of different folders on your desktop easily. 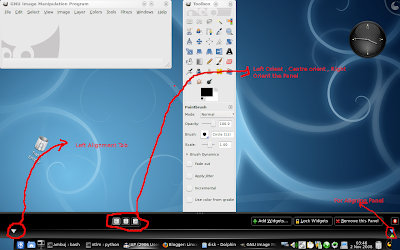 KMenu is like the Start bar in Windows , and is one of the most used feature of the KDE desktop. 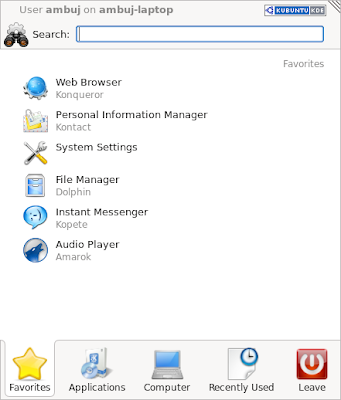 KMenu has number of different categories like "Applications" , "Favorites" , "Recently Used" and "Computer" which helps in properly organizing applications and document links . KDE 4.1 includes the refurbished oxygen icon and widget theme , Oxygen is extremely visually appealing icon/widget/window theme and gives KDE a visually aesthetic look. Oxygen uses SVG vector images to represent Icons, which allows using alpha channels, translucency, embedded bitmaps to allow complex three dimensional effects, with highlights and shadows. For improving identification of Icons of different types , Oxygen uses slightly different characteristics of shape, detail and color for Icons of different types. The state of art Phonon Multimedia API - which provides multimedia support to various applications running atop KDE 4.1 without having to worry about underlying framework like Xine or GStreamer. Akonadi Personal Information Management Framework :- Akonadi stores data for mail applications , calendar , address book etc . Akonadi helps in making data of one application compaitable with another application, Also Akonadi ensures that if data changes in one application it is reflected properly in other applications too. Solid - Device framework that allows different KDE applications using Solid to know easily about Hardware Device status without worrying much about underlying hardware layer. 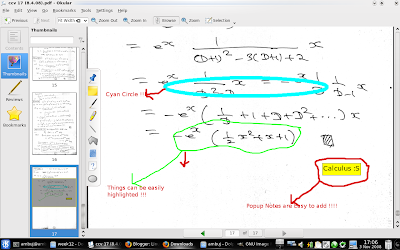 Okular - Okular is an extremely popular document viewer that allows you to view different document files like (.pdf , .ps etc) easily it even allows you to scribble , underline , highlight , add notes etc while browsing documents . 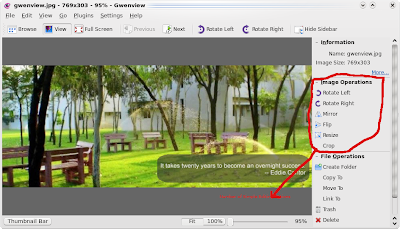 Gwenview - A Simple image viewer that supports basic image manipulation. KOffice - Open source Office Suite based on KDE libraries. Conclusion : KDE 4.1 is a visual delight ,Plasma desktop is one of the coolest looking desktop shell you will find across Operating Systems, it is definitely Linux Desktop of the future and with the included frameworks like Phonon , Solid etc KDE 4.1 makes the task of developing applications for KDE relatively easy for developers. 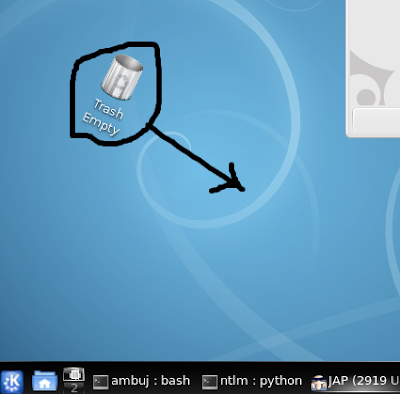 Impressed , A number of linux distributions like Kubuntu 8.10 and Mandriva Linux 2009.0 comes preinstalled with KDE 4.1, also it is relatively easy to install KDE 4.1 on Ubuntu , Fedora or anyother major distribution. Important : Some of the Images in the article have been taken from different KDE subprojects website. I've also been a long time GNOME and Ubuntu user and just when Intrepid came out I decided to take a look at Kubuntu with KDE 4.1. I can tell you I fell in love. Kubuntu looks so much better and the new concepts in KDE 4 are totaly awesome. I also love some of the new apps like Dolphin, Gwenview, Okular. There are still minor stability issues with KDE but this is quite reasonable considering how young KDE 4 is. Agreed , infact i have spent major portion of my time in the past 3 days playing around with KDE 4.1 .. I have not even logged into Gnome . Though have to agree KDE 4.1 is little slow compared to Gnome :'( .